One of the primary reasons owners reach out to a professional dog trainer is because of a behavior problem. Whether it's a serious problem like aggression or a seriously annoying problem like jumping on guests, the cry for help is motivated by a problem. This is certainly the case for the vast majority of my clients. Once I get into the home, owners are often eager for me to see the problem in action. My guess is that they want to see how a professional responds; they want to know the right way to correct or discipline the dog so that the problem goes away. After all, that's why they hired a trainer, right?! Modern dog trainers approach behavior problems in a drastically different fashion. Our first goal is to stop the dog from repeating the bad behavior. We don't actually want (or often need) to see the behavior prior to coming up with a plan. * While the result sounds identical to the owner's goals, our motivations and approach are very different. Owners want to immediately address and solve the problem where it's occurring--in a real life scenario. They have been dealing with this frustrating issue for weeks, months, or even years and are fed up. They know what they want from their dog, but the dog doesn't seem to get the message. Trainers want to immediately implement management in real life scenarios. The management stops the problem from happening and gives the family the relief they've been wanting. Once the management is in place, trainers begin to train new behavior habits. The important distinction is that trainers see the real-life scenario as a goal, not the starting line. Real-life is always the biggest challenge for the dog, and that makes it the absolute worst time to begin teaching new behaviors. Instead, trainers always start the training several steps back--at a level the dog can handle--and then advance to the real-life scenario from there. Not only does this make learning easier for the dog, but it also prevents problem behaviors from becoming habits. Practice makes permanent! If Step 1 of the plan to change your dog's behavior occurs during the misbehavior, the plan needs to be reworked. 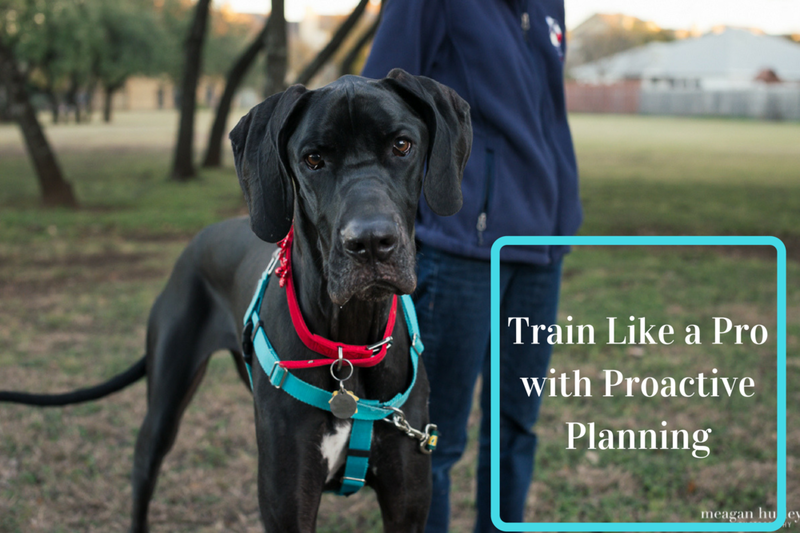 Professional dog trainers change behavior with proactive plans instead of reactive responses.